Are car accidents up or down on Corona’s 111th Street since the DOT redesigned the street? They are up says Community Board 4. Nope, they are down says DOT boss Polly Trottenberg. On January 11th the Queens Chronicle published an article saying that car accidents had been on the rise on Corona’s 111th Street since the Department of Transportation had redesigned the street this summer. The article mentioned that between August 1st and November 20 2017 49 crashes were reported on 111th street compared to 38 for the same period the year before. Already a month before the publication of this article, the community board 4 had sent a letter to Queens Commissioner Nicole Garcia to express their concerns. In the the letter the CB4 was asking the DOT to revisit the design of the street because they didn’t believe it was making the street safer and was reducing the number of accidents. On Thursday, Polly Trottenberg personally replied to the CB4 attacks in an opinion in the Queens Chronicle. 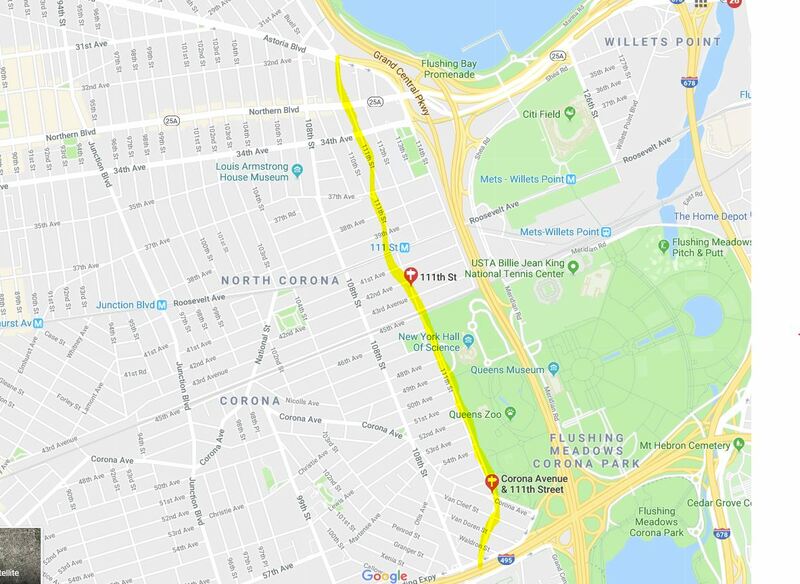 According to Trottenberg, the CB4 is looking at statistics that are covering the complete length of 111th street (in yellow on the picture) while they should focus on the official project area which is from 43rd Avenue to Corona Ave (between the two red signs on the picture). In this exact area the number of accidents recorded from September 1st to November 30th decreased by 4 from 16 to 12 between 2017 and 2016. Therefore Trottenberg insists that the street redesign is making the street safer. It would be interesting to understand then why the rest of the street became less safe after the redesign?